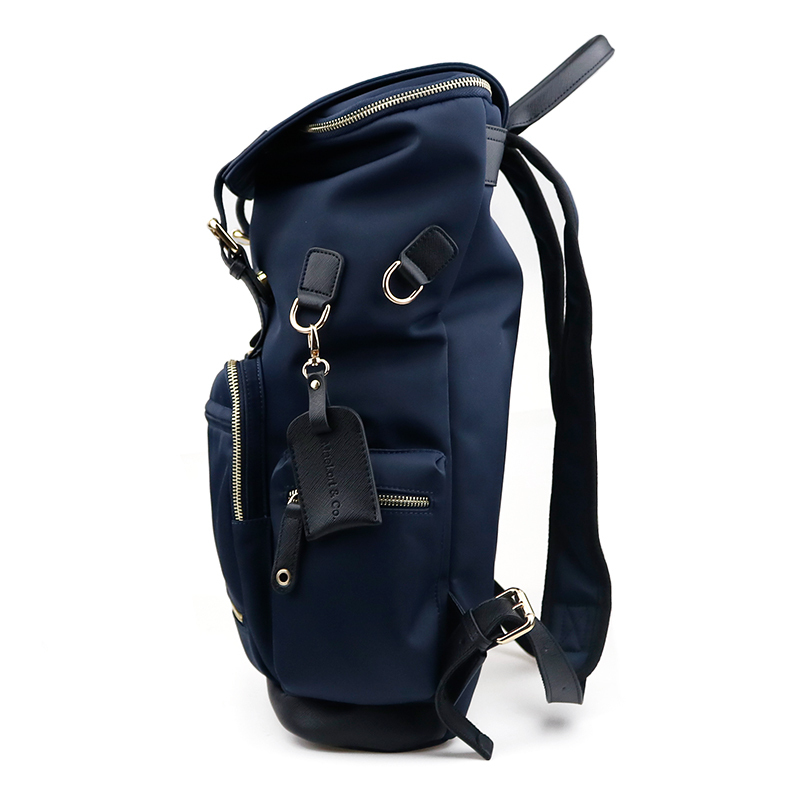 Ring Backpack 1 in Waterproof Technical Nylon Navy/Black Leather - MaeLort & Co. Shipping Status: PRE ORDER. Estimated Ship Date is 4/22. A lightweight showerproof hybrid rucksack that can be utilized as a ring backpack or daily/travel backpack. Hidden helmet holder that utilizes it’s own zipper pocket to be easily stowed away for non-helmet usage. Magnetic button snaps are used instead of traditional snaps to secure top cover for quicker and more convenient closing. The bag is made from durable nylon woven in a compact gabardine construction. The easy, soft structure is influenced by military archive styles from the early 20th century and is reworked with multi-zip pockets for added functionality. This style maximizes storage spaces while limiting bulkiness. Multiple pockets on the inside and out, as well as a crop holder, bottle holder, and internal laptop sleeve. Multiple D-Hooks for a variety of uses including spurs. I bought this bag for school as well as for shows and I’m literally so happy I did, It is perfect for both. Definitely recommend. I ordered this bag in May and finally received it in September. And to say it was worth the wait is an understatement! I absolutely love this bag and everything about it. Definitely recommend!